Welcome to Miss. Ross' Grade 3 Class! Here is what we did on today. Math: Today we worked on our 6 times tables. We played circle up first to practice the numbers and then did a math worksheet. Language: We started our lesson with our Lesson 9 Spelling Test. We continued reading our novel "The Little House in the Big Woods" by Laura Ingalls Wilder. We read chapter 9 now! We did a tableau activity, the students were placed in groups and had to decide on an important event that took place in the chapter. Each tableau was very well done, especially for our first one! Great job everyone! Gym: Please see Mr. B's blog for more information. UOI: Today we learned about animal tracking. We discussed the importance of animal tracking to the pioneers and how we are very fortunate today that we do not have to go to that extent to get food. We also talked about how it was important to know what we were tracking as to ensure that it was going to give your family enough food.As an activity, the students were separated into groups and told to follow a certain type of animal track throughout the "forest". They were placed around the school and were numbered so the students had to follow the numerical order of the tracks in order to find the animal they were looking for. They loved this activity! It was great to see them explore! Art: To pay tribute to Remembrance Day we created poppies collages. We used texture and emphasize to drawn someone's attention to the red poppy in the middle of the black, grey and newspaper collage. French: Please see Mme. Stella's blog for more information. Take a look at what your children did during French and music! Central Idea: Our well-being is influenced by the messages portrayed in the media. Responsibility – What is our responsibility? Reflection – How do we know? · How do we use media to persuade? · How does the media influence our well-being? Summative: Create your own advertisement. Central Idea: Early cultures and settlers shape our world. Causation – Why is it like it is? Perspective – What are the points of view? Summative: A day in the life of a pioneer. Central Idea: Forces causing and changing movement can have a significant impact on humans and the environment. Summative: Creating a mechanism that displays three or more forces and explain. Central Idea: Geographic and environmental factors influence the development of communities. Form: What is it like? Causation: Why is it like it is? Change: How is it changing? Summative: Create your own town or city by using knowledge of geographical features, create a model of your city and a soundscape to match your town or city. Central Idea: Imaginary worlds can be expressed through story telling. Perspective: What are the points of view? Summative: Create your own story by choice of genre. Central Idea: Plants and soils are essential for life on earth. Summative: Create your own plant and explain the needs of the plant. If you would like to take a look at what all of the grades are doing in UOI you can take a look at our POI chart! Follow St. Jude's on Facebook! Book Fair and Year Ahead Day!!! Don't forget to be owlsome! Please check the blog every evening for new updates about what we are doing in grade three! 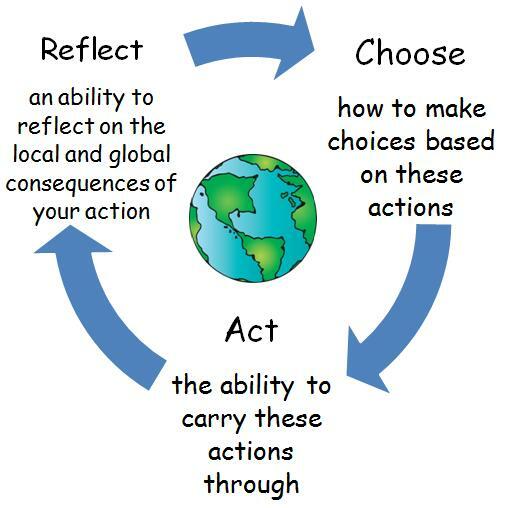 Action is a very significant aspect of the IB learning process. The purpose of this initiative is to help further knowledge about what has been learned within the classroom. Example: If we are learning about recycling, students might go home and tell you that they want to implement a recycling program with you at home, or they may do something simple like telling you that something you were throwing in the garbage may be recycled. Action comes in many forms; it might be something small to something very large, but as long as the children understand the concepts, action is important no matter the size! If your child shows action at home I want to know! Please email me and we can celebrate these amazing students together! Welcome to Miss Ross' Grade 3 Class! !